These whorls have all been fitted at the bottom of their new shafts, as I think that they would have originally been used as supported spindles to spin very fine threads. Supported spindles, as their name suggests, are used with the bottom tip of the shaft resting on a surface; either your lap, or a small bowl placed in your lap or on a table at your side. Spinning the spindle in this way you can create a very fine thread, and it doesn't have to support the weight of the spindle as you spin. Please visit my Etsy shop for details of the spindles I have for sale at the moment. 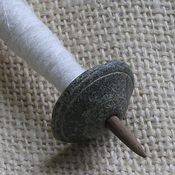 This spindle is made from an 25mm (1 inch) diameter ancient stone whorl. These types of whorls are made from black steatite stone, are found in the Holyland and usually dated to the Roman era around the 1st - 3rd century CE. 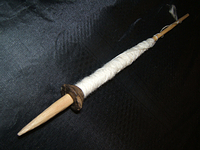 The whorl is mounted on a new hardwood shaft approx 20cm (8 inches) long. Shown here with very fine Bowmont fleece spun from hand-combed sliver. It always amazes me how well these little tools were made, something that is around two thousand years old, with just the addition of a new shaft, can be made to spin beautifully again today! This spindle is made from an 18mm (.71 inches) diameter Dutch 'Spinloodje' (literal translation - Spin Lead) from the Middle Ages. This whorl was found in a field in Holland by a Dutch metal detector, and is mounted on a newly hand-whittled wooden shaft 220mm (8.75 inches) long. 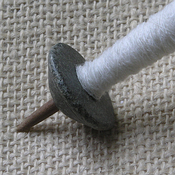 Shown here with the results of test spinning some cotton. 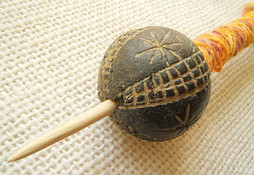 The spindle above is made from a modern example of a carved clay bead whorl from Mali, Africa. 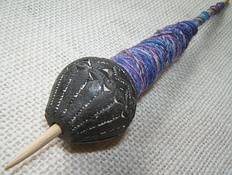 It has been fitted to a new hardwood shaft which is almost 8" long, and is shown here being used to spin a dyed cotton and silk blend tops. This whorl is also from Mali, but is an older example than the one above. Mounted on a newly whittled shaft again to make a practical well balanced support spindle. It is shown here in the middle of spinning a batch of cotton wool that I dyed in an Online Guild workshop.